I knew very little about Jason Nowak’s Stolen Thunder, but I saw the trailer and loved the look and sound of it. In fact, if I were to design my own game, I would probably want the same color palette. It did seem a bit reflex-based, so I was nervous I might get frustrated with it early on. But I’ve wasted far more than a dollar on games, so I took the chance. And I could hardly put it down until I beat it. The game is slick and stylish, with minimalistic graphics that are anything but plain. 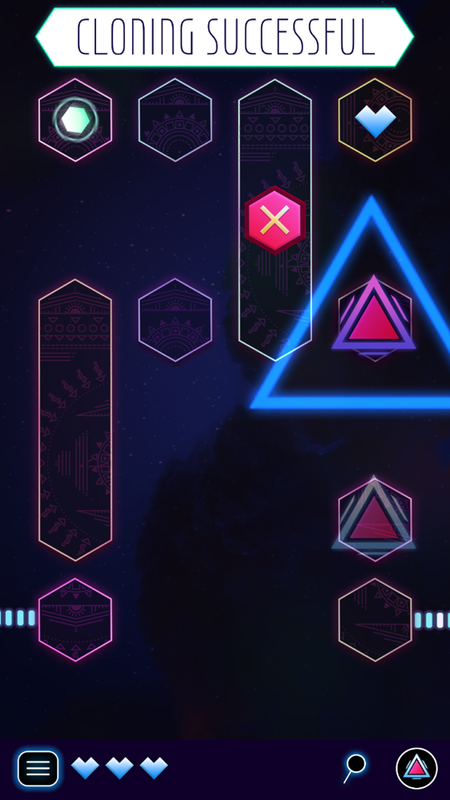 Yes, your path is made of hexagons and you control a triangle. But there are pastel clouds in the background, occasional rain, and the animations throughout just scream of polish. The music and soundtrack are also spot on, kept me immersed the entire time, and I never got sick of them. I absolutely love the whole presentation. But let’s talk about the gameplay a bit, since Stolen Thunder is far more than a pretty face. It’s a perfect iPhone game, as it plays in portrait mode with one hand. 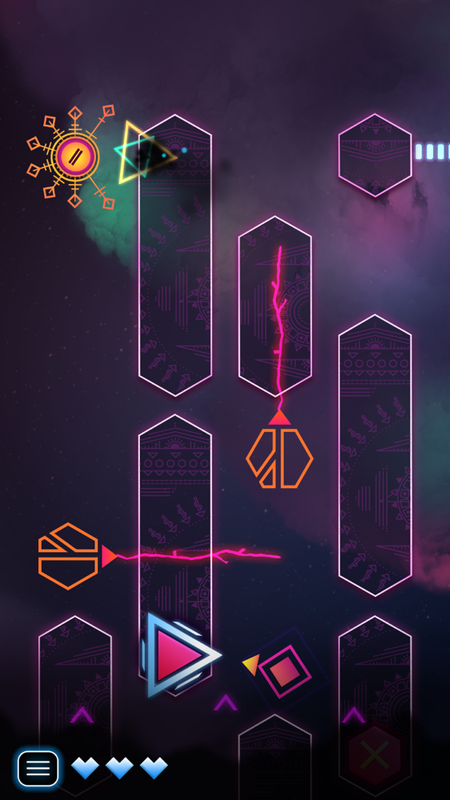 There are only two actions in the game — you swipe to move your triangle in a direction and you tap to make it shoot lightning straight in front of it. There are currently twelve levels to complete and the goal in each is to get to the exit, picking up three gems along the way. You don’t have to pick up every single gem to get through the game, but that gives you an extra challenge and is very much worth trying for. Things start off simple enough, with you needing to stop and shoot enemies to make them vanish. If you try to move onto one instead, you’ll lose a life. But you have three of them and there are several around each level that allow you to replenish one that you lost. If you run out of lives, you die and have to restart the level. Besides the regular enemies, you’ll also encounter lasers and rotating obstacles that harm you if you don’t pass them at the right moment. 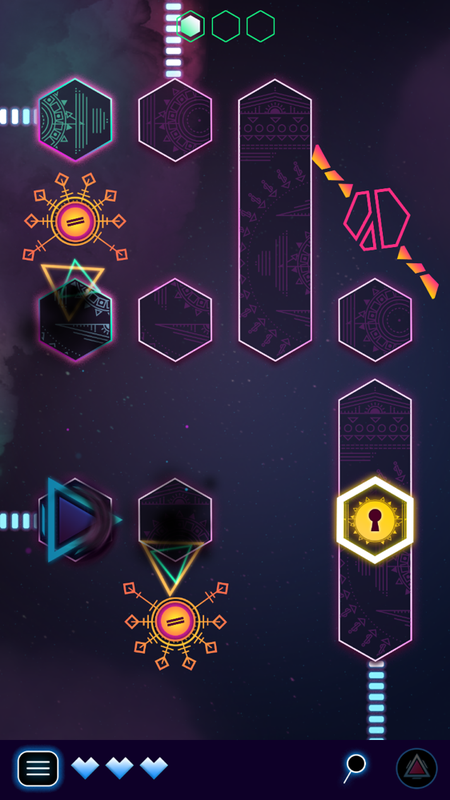 Soon you’ll encounter locks that open with a key and gates that open when you shoot the button of the same color, and portals that teleport you from one area to another. In some late-game puzzles, your lightning attack will be replaced by wind, allowing you to blow things around but leaving you more vulnerable without your deadly attack. It also changes the puzzles up quite a bit. One of my favorite mechanics is the cloning, first because it allows for some really interesting puzzles, but also because it keeps those puzzles from becoming tedious. For instance, on one level you need to strike a cannon to make it shoot at things you can’t reach yourself. There are also mirrors you can rotate so the cannon balls can bounce off it. The developer could have made the level feel longer — and more tedious — by simply having locks around the level instead of cloning spots. But the cloning means you can leave one triangle near the cannon and adjust the mirrors with the two other cannons. It becomes a really interesting and satisfying puzzle that allows room for trial and error without becoming tedious. The game also allows you to zoom out and look at the whole map, which is very helpful on the larger levels, especially when you need to shoot something from one screen to another. I should mention, for those who don’t like fast-paced games, that four of the twelve levels have you racing against the clock, a bit like an auto-runner. You have to constantly keep moving upwards toward the exit or you’ll get swallowed up by the bottom of the screen and die instantly. 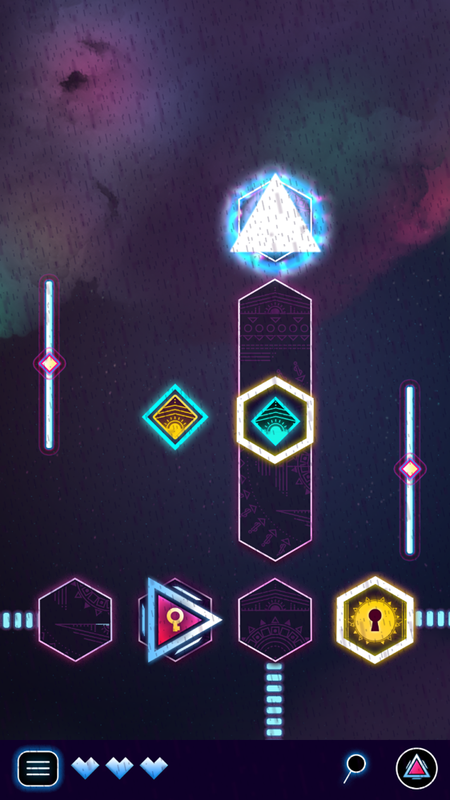 These levels are scattered throughout and you have to play all the levels in order. I personally prefer the puzzles that let you take your time, but I was determined enough to complete the game 100%. Since each level is hand-crafted, it does help to memorize the path so whatever killed you last time won’t be able to take you by surprise. Still, there are a couple of super fast-paced levels near the end of the game, and it’s not going to be for everyone. But if you don’t mind a bit of a speed challenge, definitely give this game a go. I did have a few small issues with Stolen Thunder. There was something that wasn’t explained that made me think I had to keep starting over if I messed up while working out a specific puzzle in a level. The developer clarified how I could just reset that puzzle and that made all the difference. He also made it a little more obvious since, so players are more likely to figure that out on their own. The slow loading times are also a bit of a downer for me, especially when I die and have to wait to restart instead of jumping right back in. It makes death that much more painful. But the developer is very responsive to feedback and has already stated he’s trying to reduce the load times. But even with those, they’re only at the beginning of a level and everything runs smooth as butter and is super snappy and responsive. I very rarely ran into any bugs or glitches that I could blame my failure on. And while this isn’t a problem so much as a feature request, I think it would have been cool to have some sort of high-score chasing for those who want to speed run the levels. They’re short enough that even I’ve been doing that on my own, but some sort of record of them and perhaps a leaderboard would give the game some replay value. Overall, I thoroughly enjoyed my time with Stolen Thunder, even when something felt impossible. The levels are varied enough to keep things interesting from beginning to end. And, of course, it’s got those crisp, clean graphics and animations, as well as a fantastic soundscape to keep your senses happy as you make your way through it. I do wish there was more, but I’m glad it wasn’t padded out with a ton of repetition to make it seem longer. And the developer does have plans to add more content in the future. If you’re looking for a solid action puzzler to keep you occupied for a couple of hours and don’t mind the reflex-based sections, definitely give it a try. You can download Stolen Thunder here and if you get stuck, try my walkthrough guide.